About 23 miles north of downtown, Intercontinental has been Houston’s major commercial international airport since it opened in 1969. 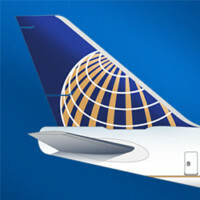 It is a hub for United Airlines, which accounts for more than half of the airport’s passengers, many of whom are connecting on east-west U.S. domestic routes or using the airport as a gateway to/from Latin America destinations. The drive to downtown Houston takes about 25 minutes in normal traffic. The airport has five terminals, labeled A, B, C, D and E. Each has a unique floor plan. All of the terminals are interconnected via an automated train system called the Skyway. International arrivals and departures use gates on the D and E concourses. United Airlines flights arrive and depart at gates on the A, B, C and E concourses. Connecting passengers arriving on domestic flights, or international flights that were pre-cleared by U.S. Customs at their departure airport, can use the Skyway automated train system between terminals without exiting the TSA secure area. Connecting passengers arriving on international flights who clear U.S. Customs at Houston will find the TSA’s international re-screening area can be chaotic and slow when it’s busy. Also PreCheck is not available. An often more efficient alternative is to exit the international arrivals area as if you are a local passenger leaving the airport. Once in the International Arrivals Lobby take the escalator up to the ticketing level where there is a TSA checkpoint with PreCheck. United has check-in counters and baggage claim in each of the four terminals it uses. Houston is big even by Texas standards. With a population of more than 2.3 million, it is the largest city in Texas and the fourth largest in the United States. It is an industrial center and claims to be the headquarters to more Fortune 500 companies than any other U.S. city. The region’s main industries are energy, manufacturing, aeronautics and transportation. For better or worse, the city is the largest in the U.S. without a zoning code. If you’re planning a trip, Visit Houston has more information here.